I had an amazing blog entry written today, but I just erased it all. Why? Because I tried to get too wordy and too “deep” and that just caused the blog to seem fake. It might have won me a Pulitzer, but it didn’t fit my normal writing mood. I know if my mood changes, then my fans and followers would get upset and I would be stuck writing a blog that no one ever looks at anymore. I did keep the title of my blog entry the same, just so you can see how poetic I was probably going to get had I kept the original text. To be honest, I have no story or historic event in my life that could even relate to our recent Indians in the Community event held at Providence House. To try to create one just for point of reference would simply be an injustice to what the great people at Providence House stand for. The Cleveland Indians continued their April Indians in the Community program by volunteering at Providence House in Cleveland. Providence House is an organization that fights to end child abuse and neglect by protecting at-risk families, empowering families in crisis and building safe communities for every child. Located in Cleveland’s Ohio City neighborhood, Providence House serves kids ranging from infants to 10 years old. Their hope is that children everywhere are raised in safe, loving families free from abuse and neglect. Since the creation of Providence House 31 years ago, they have become more than an emergency shelter for children; including case management and supportive services for both the children and their families. The Indians front office volunteers included staff from varioius departments as well as Meryl Masterson (wife of Indians pitcher Justin Masterson), Jenna Gomes and her husband Yan Gomes (Indians catcher). We started off our morning touring the facility. From there, we were split into two groups. One group assembled intake bags, which are kitted items that each child receives upon arrival at Providence House and takes home when he or she leaves (toothbrush, 5+sets of clothes, shoes, etc.). The other group was able to play with the kids who are staying at Providence House on their new playground at the newly remodeled and expanded House. The volunteer event took place just days after Indians 1B Nick Swisher and his wife Joanna generously donated $75,000 to Providence House during the pre-game ceremonies of Opening Day. The Swishers, known for their charitable efforts and contributions, have clearly brought their philanthropic ways here to Cleveland with them and for that, we thank them. If you’d like to learn more about Providence House or would like to volunteer, visit http://www.provhouse.org. Thank you again to all who helped out and to the players and their wives for spending time volunteering on one of their few, precious off days! I can’t say that nothing has been going on since my last entry, because we have been swamped with things going on. To start, I recently returned from our Spring Training facility in Goodyear, Arizona. I was there for about a week for our yearly signing day. This is a day where our all of our front office autographed needs are fulfilled. We have the players come in early before their workouts and have them sign. And sign. And sign. All in all, we had about 4,000 items ranging from baseballs to photos, jerseys and bats get autographed and then authenticated. All in a shade under 3 hours. Not bad. The majority of the items are used for our in-kind donation requests that come from local charities across the state of Ohio. If you are having a fundraiser, feel free to submit by going to www.indians.com and clicking on the “community” tab. While we try to respond favorably to all requests, there are some that we just can not fulfill based on our guidelines. What else has been going on? 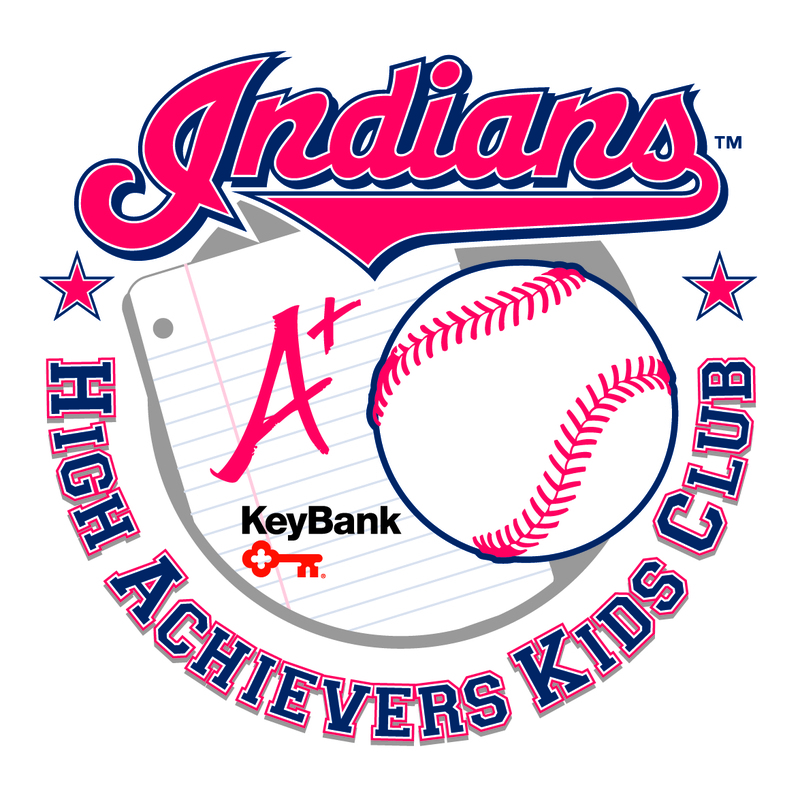 Our Cleveland Indians KeyBank High Achievers Kids Club (yes, it is a mouthful, but totally worth it) just finished the 1st semester of submittals. For those that don’t know, this is a free program for kids ages K-8th grade. They have two opportunities to submit their grades, attendance and reading forms–once for the 1st semester and once for the 2nd semester. They earn STARS based on maintaining A’s and B’s, getting perfect attendance, and reading 3 books per semester. They can then redeem the STARS for prizes at the Team Shops (free game tickets, posters, chances to win meet-and-greets, etc.) For more information on that, go to www.indians.com/highachievers or shoot me a comment and I’ll get you more info. This Wednesday, we’ll be taking our Indians in the Community program out to the Boys and Girls Club (Broadway Club), where we’ll be hanging out with the kids from 3:00pm to 6:00pm. I’ll have more on that Wednesday night/Thursday morning. That should cover everything that I wanted to cover. Stay tuned later this week for more information! Today was the first Indians in the Community event of 2011 and it went pretty well. We started off small for the first event and had about 11 volunteers help out at St. Augustine Hunger Center in Cleveland. 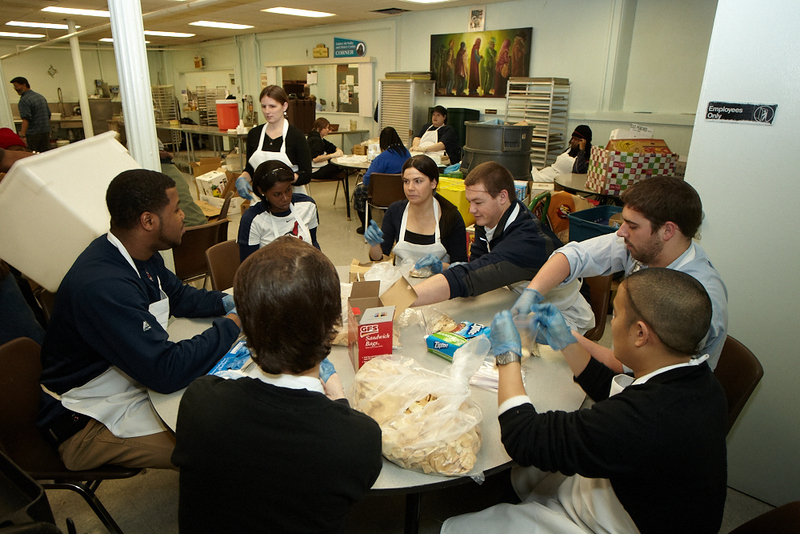 The volunteers were members of the Cleveland Indians front office and their job was to prepare and serve lunch to the needy. Upon our arrival, we were told that we weren’t just going to assist preparing the food–but instead we were going to make it all ourselves! The normal cook said she was going to “trust” us to prepare whatever we wanted. She gave us about 15 tubes of ground beef (yes, they came in wrapped tubes) and a ton of sauce. What else could we make, but some good ol’ spaghetti and meatballs. We also added some potato soup, garlic bread and salad. Below is a picture so you can see that we actually were there with our hair nets on and everything! I now know what the Lunch Lady felt like in Adam Sandler’s song “Lunch Lady Land.” I didn’t hear any complaints on how the food tasted, so we must have done okay. The blog will take a small break before our next big Community Outreach adventure, but I may still post some Tribe-type things up here just to keep you all on your toes. B.A.T.S and Killer B’s made it to the championship game with B.A.T.S winning the trophy. It was a very close game all the way, but they edged out a win. After the championship game on Thursday night, the campers had all of Friday to hang out and relax until the final banquet Friday night. We held a raffle, a silent and a live auction. All were pretty successful and raised over $14,000 for Cleveland Indians Charities. Add that to our total of a little over $5,000 from Kangaroo Kourt fines and we had a pretty successful week. There will be many happy youth baseball teams that, I’m sure, will appreciate the money.